Have you ever wondered why laptop computers are called laptops, when it seems obvious that most of them aren’t designed to be used on a lap? If they were designed for that purpose would they run so hot, or emit high frequency electric fields from their undersides? And would they have their ventilation slots situated on the bottom where their user's legs will block them up and cause the machine to run even hotter? Many people, if they have to use their machines for any length of time, end up using them on a table or desktop. That has the advantage of letting you use a mouse or a graphics tablet, but it has the serious disadvantage that crouching to view the screen for long periods can result in neck and lower back injuries. Injuries that can sometimes cause problems for years. The irony is that sitting with the laptop on your lap whilst leaning back into a comfortable chair is the most ergonomically correct way of using the machines. It puts your neck in a relaxed position for viewing the screen and removes any strain on your back. Of course, you have to do something about the heat and having somewhere to put the mouse helps considerably. That’s where eTray comes in. 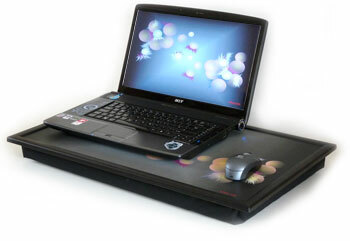 An eTray™ laptop tray can turn your hot and uncomfortable laptop PC into a true laptop computer that can be used for hours in comfort. An eTray consists of a hardwearing laminated tray attached to an insulated conformable beanbag lap pad. This combination provides your notebook with a stable, portable working surface that keeps the heat generated by your machine well away from your legs. An aluminium shield layer helps keep electric fields away from your body. The improved posture and reduction in heat provided by eTray will help reduce some of the potential health problems associated with laptop use. It will also, by allowing the free flow of air under the machine, let your laptop's cooler operate the way it was designed to. That can result in better performance, longer battery life, and it will make it much less likely that the machine will be damaged by overheating. 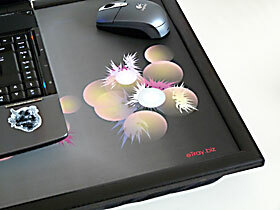 The Standard size eTray is large enough for a widescreen laptop and provides room for a mouse. This means that you won't have to fiddle around with a clumsy touchpad to make best use of your machine. And, if being a useful tool that you will find yourself using every day is not enough, each eTray is also a unique handmade work of art that will look good in any living room. "Most manufacturers will void the warranty if there is evidence a machine has been damaged by overheating caused by blocked ventilation slots ..."
"sitting with the laptop on your lap whilst leaning back into a comfortable chair puts your neck in a relaxed position for viewing the screen and removes strain on your back ... having somewhere to put the mouse helps considerably ..."
An eTray laptop tray will make your laptop much easier to use and, as a result, you will find that you can be much more productive with it. Two sizes to suit different sized laptop computers. Tough laminated surface designed to withstand years of use. Insulated conformable beanbag lap pad for comfort and stability. 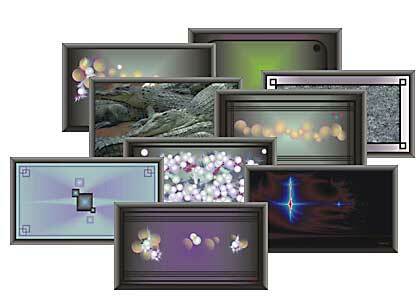 Integrated screen layer helps protect you from RF and IR radiation. Deck features exclusive printed designs. 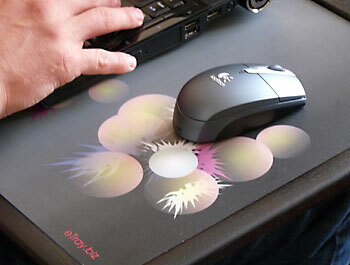 Works with optical and laser mice. 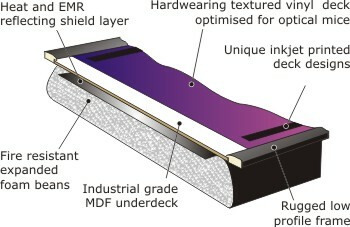 Because they are custom made to order, eTray decks can be printed with any design that you choose. We make available a number of unique, limited edition, collectable designs completely free of charge. There are geometric patterns, photographs, and computer generated fractal designs, all printed in high resolution using permanent pigment inks. You can also choose a plain colour or send us an image of your choice so we can create a personalised eTray especially for you. eTrays are constructed carefully in the UK from high quality materials and are supplied with a full 12 month warranty against manufacturing defects. They are also covered by our 30 day money back, no quibble guarantee. Try your eTray for 30 days. If it doesn't meet your expectations send it back to us and we will refund the purchase price. We have put together a list which contains answers to some common questions you might want to ask. You can get to it by clicking here. Altenatively, visit the eTray News blog. This contains articles and news items on many topics related to eTray. If you have a technical question about eTray laptop trays you may find the answer there.